Here’s an extract from the rather beautiful 1852 plan of York. 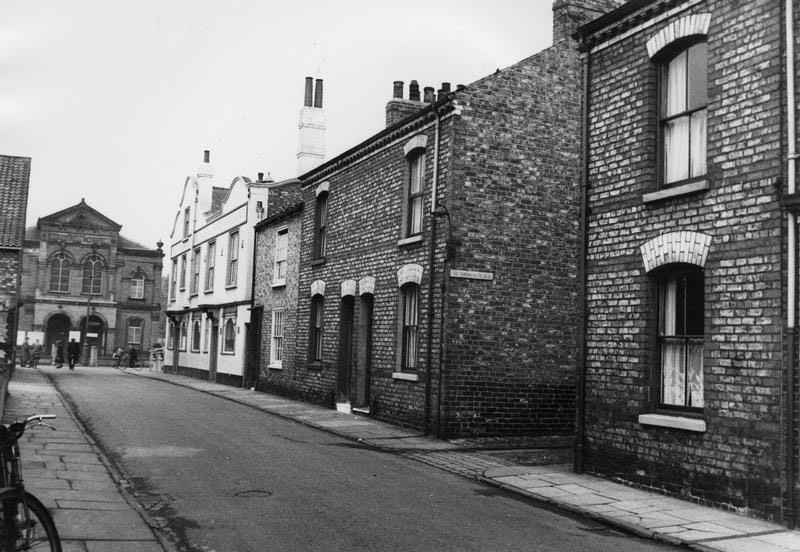 The corner of Haxby Road and Lowther Street, where the Punch Bowl is. As you can see, in the 1850s it’s shown as part of a line of terraced houses called Clarence Place. (141) The Punch Bowl Hotel and Houses, Nos. 2–12 (even), were called Clarence Place in 1850 (OS) and some or all of them were built by 1838 (Directory). 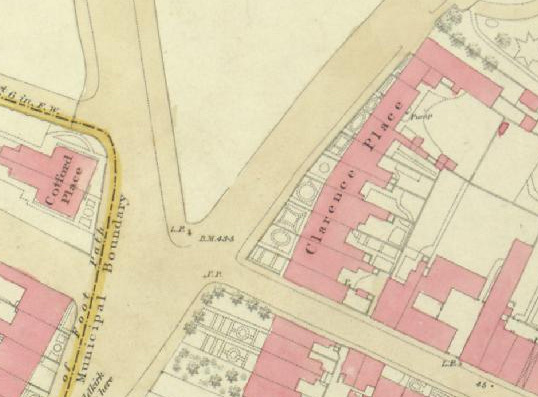 The Punch Bowl Hotel is possibly a remodelling of two of the houses in Clarence Place on the 1852 OS map but has been altered out of recognition. Nos. 2 and 4 form a pair, but No. 2 is now incorporated into the hotel. The doorways together form a unified composition with three fluted pilasters with Ionic capitals and a frieze with paterae and incised fret ornament. No. 2 has a segmental bow window with similar frieze to the ground floor. Nos. 6, 8, 10 have bay windows with canted sides which are probably additions. I have no idea what it’s like inside, as I haven’t been in it for years, and must have a nosy sometime. But as I said on the earlier page, I think it’s a very attractive building in its setting. Those low walls running from the front of the building to the road, strange subdivisions in the beer garden area, make sense now, presumably reflecting the boundaries of the original plots of the houses of Clarence Place. Slightly wonky — perhaps the photographer had just left the pub. But the most striking thing about this photo, apart from the wonky angle, is the close proximity of the pub and the chapel. This view reminds us that when these communities were established the chapel and the pub were both considered important meeting places. Groves Chapel has for a while now been redundant as a place of worship. But the pub is far from redundant, and is still valued by the community. If you’re interested in present day comparisons: the Google Street View of the above view showing that the exterior on this side has been stripped of some of its original features since. — is an extract from this letter (PDF). It puts the case — and very persuasively too — for an ‘Article 4 direction’, which is the only thing that could give the pub and others like it any protection. I’ve ended up spending more time at the Punch Bowl than I intended. Which is so often the way with pubs, isn’t it. Drink up folks, we’re off to the Corner House next, on Burton Stone Lane. The licensee of the Punchbowl during the 1940s and 50s was Mel Rosser, ex Wales, England and GB rugby player. So well known by the locals that the pub was usually referred to as ‘Rosser’s’ rather than the Punchbowl.